Since we rarely have the luxury of beautiful north light in our shops (or for that matter the luxury of only printing during the day), good artificial lighting is essential. Luckily, technology has progressed from the kerosene lanterns and gas lights of our forebears, allowing us to print in well-lit shops in even the darkest basement. To create a good lighting plan for a shop, you need to understand several essential elements—the quality of the light you’re adding, the quantity of light you’re adding, and then, as a practical matter, the efficacy (light output v. energy—or dollar—input) of the source. To understand light quality, an understanding of some basic lighting concepts is needed: character, color temperature, and color rendering index. Character refers to how “hard” or “soft” a light source is. Hard light creates sharp, well defined shadows, is very directional and has high contrast between the shadows and lighted portion of the scene—the ultimate hard light is direct sun. It’s great for showing texture (or assessing depth of impression), but in general is tiring to work under because of the high contrast. The hardest commonly available artificial source would be a clear halogen lightbulb. Soft light creates soft edged shadows (or none at all), is non-directional and has inherently less contrast because of the “wrapping” effect that makes deep shadows uncommon. The ultimate soft light is daylight from north-facing windows. It’s far less tiring to work under because of the lower contrast, but may not be as good for tasks requiring attention to fine detail. Most artificial light sources fall in the softer side of the spectrum. Color temperature is one of the two important measures of artificial light, the other being color rendering index (see below). Temperature is called out in degrees kelvin (named after Lord Kelvin, the Northern Irish physicist), with the most common values on bulbs being about 2800, and about 5000. The standard (now disappearing) 60 watt incandescent bulb is about 2800 degrees kelvin. 5000 degree kelvin is considered standard daylight (sunlight) and corresponds to the average light from the open sky between 10:00 am and 2:00 pm. This is the gold standard for evaluating color. Many fluorescent tubes, compact fluorescents, and LED bulbs come in both cool and warm, as well as intermediate color temperatures, but there is a huge caveat regarding using color temperature alone to compare light sources. Color temperatures assume that the source is putting out a full even spectrum (we all remember the rainbow mnemonic, ROY G. BIV?). Candles do that. Incandescents do that. The sun does that. Fluorescent and LEDs may or may not do that, hence the need for color rendering index. Color Rendering Index, or CRI, is a number based on how well a given light source allows us to see color, and takes into account the fact that many sources have non-continuous spectra. The highest value possible is 100, which correlates to either daylight or incandescent light, since they both have balanced spectra. Anything over 80 is considered good, and there are fluorescents that are over 90. One of the most important things about lighting a shop is to have lots of light. It’s safer, it makes it easier to do good work, it makes it easier to maintain presses and clean up, and finally, it just makes it nicer to be in the shop. To get the most light for the least operating cost, you’ll want to use something other than incandescent bulbs. While LEDs are quickly dropping in price and rising in versatility, they continue to be the most expensive option in terms of initial cost. That leaves the fluorescent as the most cost-effective choice of lumens per dollar. While older fluorescent fixtures had a deserved reputation for being flickery and noisy, modern electronic ballasts have improved the light quality immensely, and are well worth the extra cost. Find the the tube with the color temperature and CRI that you want, then make sure that the ballasts in the fixtures are compatible. While it is common practice to measure light output in watts (as in 100 watt bulb), it is, in fact, wrong. Wattage is a measure of the amount of power that a device uses. (Look at your electricity bill—you’ll see that you’re being charged for kilowatt hours—the number of 1000 watt units times the number of hours they were being used.) The industry measure of light output is actually lumens, and most bulbs and some light fixtures will have that information available on the package or the web. This is important because we understand old fashioned incandescent bulbs. You know if you put a 150 watt bulb in your desk lamp, you’ll have a fairly bright desk. Fluorescents are about four times as efficient as incandescent bulbs, so for the same amount of wattage (electricity used) as that 150 watt bulb, you would get four times the light. Incandescents clock in at about 15 lumens per watt and compact fluorescents at about 60 lumens per watt. LED’s are much harder to directly compare because they are very directional, but usually are as good or better than compact fluorescents. In determining the number of fixtures for a space, a lighting consultant would also take into account several other things—the color of the walls, ceiling, and floor, the exact efficacy of the fixtures chosen, and the fixture mounting height. Unless your shop is painted flat black, you can get by ignoring most of those except the fixture mounting height. If you move the fixture further away from the work surface, the light spreads and covers more area. The result of this is that the further the light source is from the surface being illuminated, the more light you will need. This fall-off is proportional to the square of the distance, e.g. move the light twice as far away, and it will be one quarter as strong. Thus, if you have high ceilings, you may want to hang the lighting at a lower level to reduce the number of fixtures you need for adequate light levels. 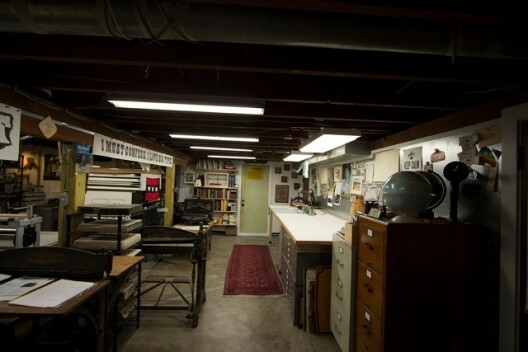 The basement shop of Jeff Shay, well lit with 5000K, 92 CRI fluorescent tubes, which provide both task and general lighting depending on the fixtures’ quantity and location.